Parking at the Blaisdell Center will be limited through Sunday due to the 20th Islandwide Christmas Craft and Food Expo. Additional parking will be available at surrounding pay lots and at the Frank Fasi Municipal Building parking structure. Valet parking will be available for the Honolulu Symphony Pops show tomorrow and Saturday at the Blaisdell Center Concert Hall. For more information, call Diamond Parking at 592-7275. 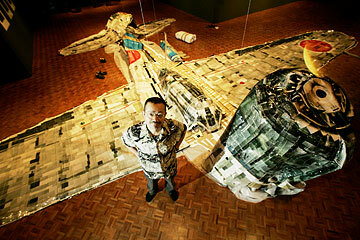 Today: Katsushige Nakahashi, one of Japan's leading sculptors, has built a Japanese Zero in the University of Hawaii Art Gallery. Part of the gallery's "Reconstructing Memories" exhibition, the airplane is made of 25,000 micro-images of a scale model of a Zero. Business: Zack and Ron Lee, inspired by their aunt's recipes, have turned Sugoi Bento & Catering into a popular eatery. Among the most popular items are garlic chicken, mochiko chicken and sesame sauce. Also in the section, Microsoft Corp. is releasing a new operating system, Vista, and an update of Office that it hopes will keep its customers satisfied. The software giant is calling the launch of its improved products "A New Day of Business." Sports: The Hawaii football team defends its ranking against Purdue of the Pac-10 on Saturday. Full coverage of the game can be found in Sunday's paper. A Japanese tourist was in critical condition Wednesday afternoon following an accident while scuba diving off Kewalo Basin. The man was taken to Straub Clinic & Hospital in critical condition, said Bryan Cheplic, spokesman for Honolulu Emergency Medical Services. The scuba diver, an elderly man, was diving with a Japanese tour group that had chartered the boat from AAA Diving. Alex Mason, chief executive officer of AAA Diving, said medical staff told him the man had suffered a heart attack. "It's not a diving accident," Mason said. "Basically, he just happened to be wearing scuba (gear) at the time." The captain alerted Mason to the emergency after the man was pulled from the water. They brought the man from the dive site to an ambulance on the dock in 12 minutes, Mason said. Police charged a 21-year-old man yesterday who allegedly sexually assaulted a 23-year-old woman in Waikiki early last Saturday. Police charged Mark Ferguson with first-degree sexual assault. Ferguson was arrested Tuesday after police said he attacked the woman as she was getting into her car about 3 a.m. and then fled. Bail was set at $50,000. Police arrested a 33-year-old man in Waianae for allegedly beating his father-in-law with a metal object during a domestic argument with his wife. The older man, 58, attempted to intervene in an argument between his daughter and her husband when he was assaulted at about 12:15 a.m. Wednesday, police said. The man came between the two, and his son-in-law struck him three times, gashing his head, police said. Police arrested the man on suspicion of second-degree assault.